About 11 minutes’ drive from the busiest airport in the country, the Murtala Muhammed Airport, Park Lane Hotel has proven to be the middle-class traveller’s delight over the years. Park Lane is a budget hotel situated at 40 Asa-Afariogun St, Eleganza Junction, Ajao Estate, Oshodi-Isolo, Lagos. Its proximity to other governmental agencies like NAFDAC head office and the Federal Institute of Industrial Research has also made it a one-stop destination for professionals. Park Lane Hotel is a three-storey building facility that contains rooms of four categories of rooms which are: Standard, Diplomatic, Executive and Presidential. Free Wi-Fi internet access is available to all checked-in guests in the rooms and also in all other areas of the hotel premises. 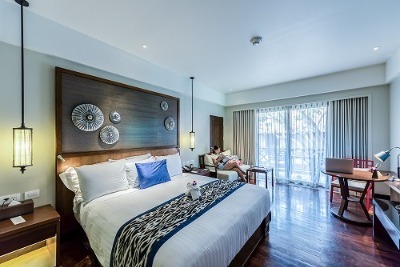 Though having varying levels of luxury and comfort depending on the category, every room has basic facilities like a king-size bed, toilet and bath ensuite, a flat screen T.V, bedside safe and intercom system. General facilities at Park Lane Hotel that are available to both checked-in guests and visiting guests are: restaurant, a bar/lounge, a fitness centre/ gym and an outdoor swimming pool. It also has a conference and banquet hall for various social events. Laundry services, 24 hours room services, 24 hours front desk services and an uninterrupted power supply are all available to make guests at Park Lane Hotel feel at home. Federal Institute of Industrial Research, Oshodi. (23 mins drive). Murtala Muhammed International Airport. (11 mins drive). NAFDAC Office Complex (10 mins drive). Lagos University Teaching Hospital (19 mins drive). Nigeria Air Force Base (33 mins drive). Q: Does Park Lane Hotel offer free Wi-Fi? A: Park Lane Hotel offers free Wi-Fi to all checked-in guests. Q: Does Park Lane Hotel have a swimming pool? A: Yes. The hotel has a standard size swimming pool. Q: Is there a fitness centre/gym at Park Lane Hotel? What types of equipment are available? A: Park Lane Hotel has a standard size gym. Q: Does Park Lane Hotel have an event centre/conference rooms? A: Park Lane Hotel has an air-conditioned conference hall. Q: Does Park Lane Hotel accept cash, cheques, cards and bank transfers? A: Cash payment is the preferred payment option. Q: Does Park Lane Hotel offer room service? What are the hours? A: A 24-hour room service is offered in the hotel. Q: Does Park Lane Hotel have a restaurant? A: Yes. Park Lane Hotel has a restaurant. Q: Does Park Lane Hotel have onsite parking? Is it free? A: There is a large and free on-site parking space in the hotel. Q: Does Park Lane Hotel offer airport pickup or shuttle services? A: Airport pickup and shuttle services are available. A: Park Lane Hotel charges per room but allows a maximum of 2 adults in a room. Park Lane Hotel is a budget hotel in Ajao Estate, Lagos. The hotel is a good place to be because I enjoyed my stay. The facilities and services at the hotel were great. The power supply was impressive and the environment of the hotel was cool. The room was comfortable and the bed size was great for a sound sleep. My check into the hotel was seamless. Everything about the hotel is nice. The place is up to standard.Kudos to the hotel's management for the good work done. The hotel is not bad in any way at all. My stay at the hotel was wonderful. The staff gave me a warm reception at the hotel, they were so hospitable and friendly. There was water and power supply through out my stay, my room was beautiful and clean. I am so impressed with all their services. Have nice pictures of Park Lane Hotel?